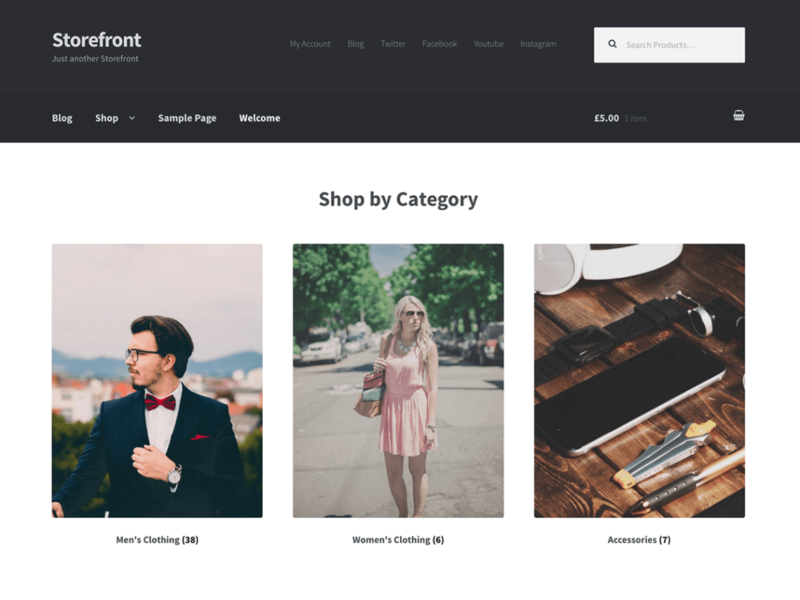 Storefront is the official WooCommerce theme for WordPress, available for free from the WordPress.org directory. 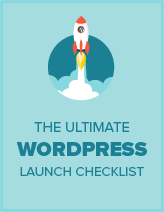 It’s a lightweight, basic theme that’s an excellent base for creating your online shop. Read our Storefront review to find out if you should run your eCommerce site on this theme. Storefront was built by the developers behind WooCommerce, the most popular eCommerce plugin for WordPress. Using WooCommerce and the Storefront theme, you can quickly and easily set up an online shop to sell your products or services. Storefront serves as a lightweight, basic theme to quickly create a functional online store. Though it includes basic customization options, if you want a more unique style you can invest in one of the premium child themes. Storefront’s features are focused on eCommerce, allowing you to quickly and easily set up shop with WooCommerce. Storefront is fully responsive and adjusts to fit any size screen. On mobile devices, a nice secondary menu is stickied to the bottom of the screen, allowing visitors to manage their accounts, search products, and checkout from anywhere. Storefront was designed by the developers of WooCommerce specifically to integrate with the popular eCommerce plugin. As long as you have the WooCommerce plugin activated, a product search bar and shopping cart link will appear automatically in the header — no need to mess around with settings or code. 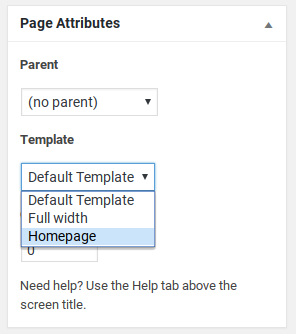 To use it, create a new page and select the Homepage template. Then navigate to Settings » Reading and under Front page displays at the top, select A static page. Then select the page you just created. Make sure to click the Save Changes button at the bottom of the page. 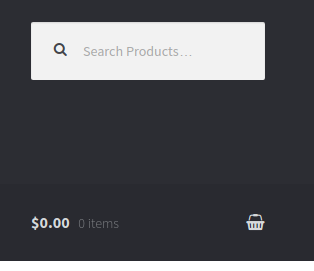 Now your homepage will display your product categories. Under Appearance » Customize, you can adjust your background color, header styles, link color, typography, button styles, and other settings to make your store your own. Storefront has just enough options to give your site a different look, without being bloated with an overwhelming array of features like many other plugins. WooCommerce and Storefront are a hugely popular combination with a large and supportive community. 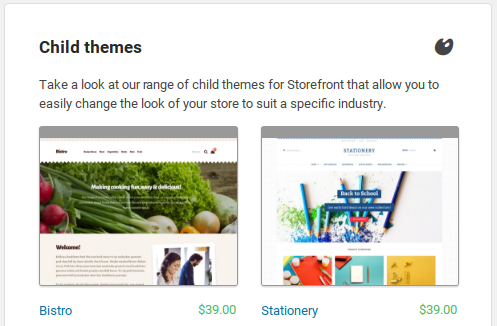 There are numerous child themes as well as free and premium plugins available if you want to add certain features or change the look of your shop. WooCommerce has a dedicated section of their site that has documentation for all their themes and plugins, including Storefront. Their Installation & Configuration document will walk you through installing and setting up the theme just like it is in the demo, and show you how the main features work. Users of the free Storefront theme can post in the WordPress.org support forums if they need assistance. The community is very active there and most support requests are resolved fairly quickly. If you purchase any premium child themes or plugins from WooCommerce, you get access to their Helpdesk where you can open a support ticket. Storefront is an excellent basic theme for eCommerce sites using the WooCommerce plugin. The integration is seamless and makes it easy to create a fully functional online shop. The theme is very plain looking, but this is intentional. Its lightweight and bloat-free design make it easy to extend and customize to suit your individual needs. Users who want a more unique look or need more advanced options for their online store will probably benefit from investing in an official WooCommerce child theme and/or plugins for Storefront. Is it a glitch that performance is rated 0.0/5.0? Two months later, performance: 0/5.